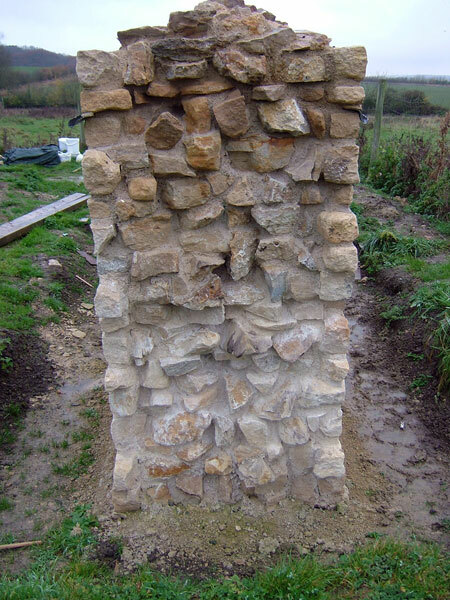 English Heritage is funding and directing the Soft Capping Research Project, which is being managed and carried out by the Rock Breakdown Laboratory. 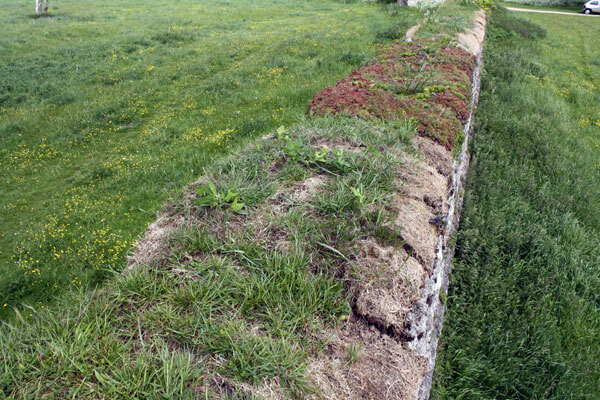 Its overall aim is to test the performance of soft capping as a method of conserving ruined walls in a wide range of situations based on an integrated programme of field trials and laboratory experiments. The first phase of this research project, which ran from late 2003 to October 2007, was designed to test the effectiveness of soft capping and compare this with hard (mortared) capping. The research studied the performance of simple soft wall capping designs, i.e. 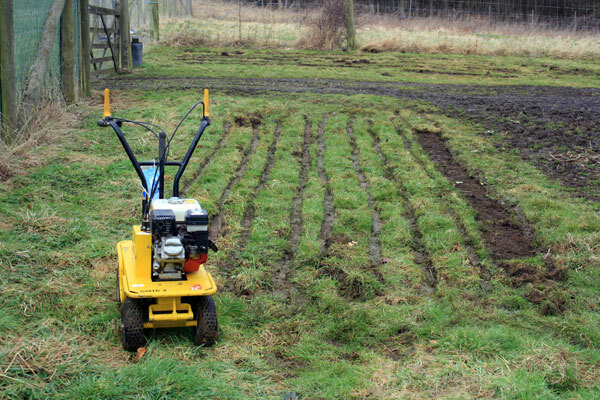 soil and grass, over a relatively short period (2-3 years) in a range of different environments across England. Our integrated programme of field and laboratory work found that soft capping provided a good thermal blanket for ruined wall tops and indicated that it may also reduce short-term moisture fluctuations in underlying walls. The research clearly indicated that this technique could be extremely beneficial to the long term conservation of ruined monuments as well as making considerable savings in maintenance and repair costs. The first phase of this project culminated in a conference at the Geological Society of London in October 2007, which attracted around 100 delegates. A detailed report based on the presentations given at this conference is available below. Discussion during and following the conference indicated widespread interest in the soft capping concept and helped to clarify further issues to investigate. 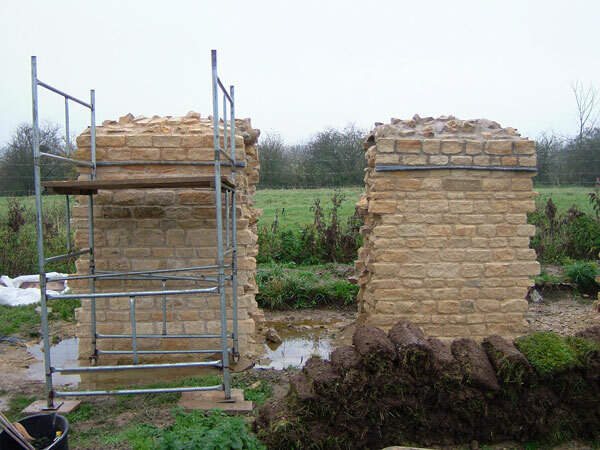 To what extent does soft capping reduce moisture fluctuations within underlying stonework? Monitoring moisture fluctuations within stonework is difficult. 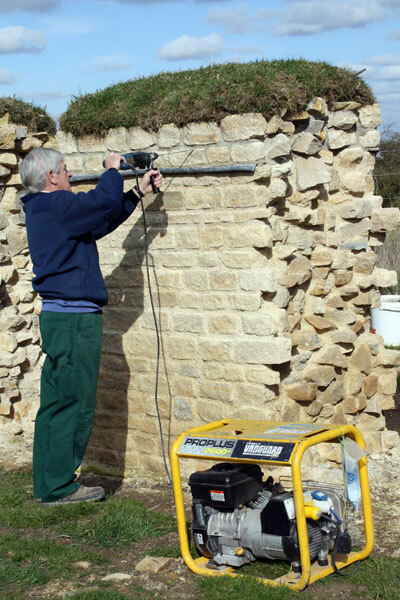 Our previous research developed some innovative techniques to monitor moisture movements in stonework, however, these now need to be applied within controlled experimental conditions. Funding for this phase of the research project has enabled us to build four test walls at our Wytham Woods test site near Oxford (each approximately 2m high, 1.5m long and 1m wide, two soft capped and two hard capped), which provides us with the opportunity to utilise our full range of monitoring techniques and collect extensive and detailed data on moisture movements within hard capped vs soft capped walls. 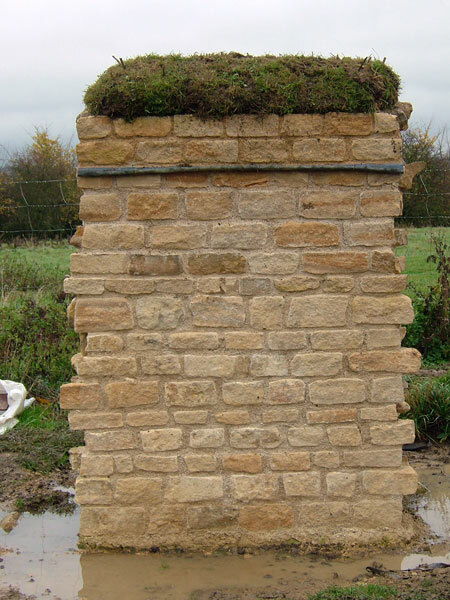 Does soft capping have any damaging effect on vulnerable underlying stonework? 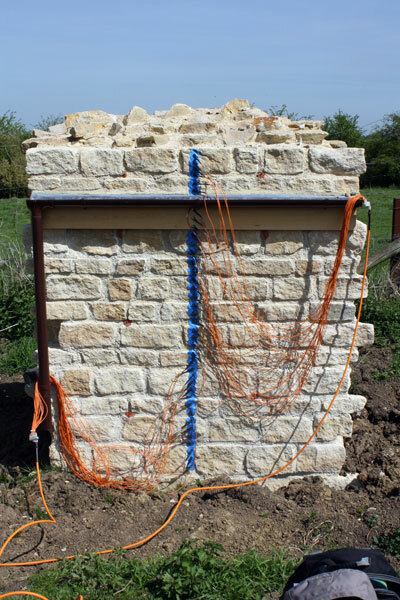 Question 2 builds on concerns that some experts have articulated that soft capping may become highly attached to the underlying stonework through roots 'bonding' to the surface. Further problems have been anticipated though acidic percolation from the plants and soil into the stone. 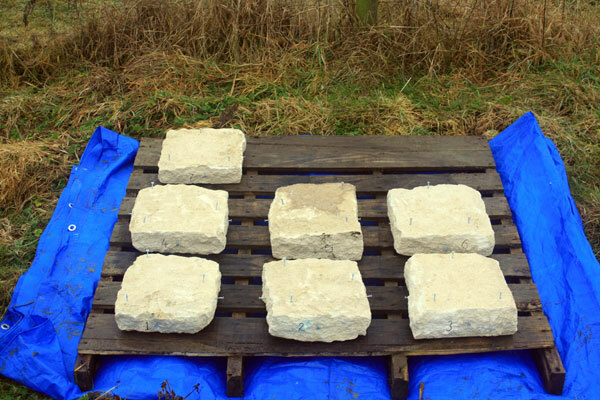 This question will be investigated by installing stone capping on individual blocks of stone. Each block will be scanned using high resolution optical scanning before capping, in order to produce a detailed digital topographical 'map' of the surface. After one or two years under capping the blocks will be removed and re-scanned. Any weathering impact of the soft capping will be measured by comparing the pre- and post- soft capping digital topographical 'maps'. Control blocks, left onsite without any capping, will also be scanned. Are more complex soft capping designs (e.g. 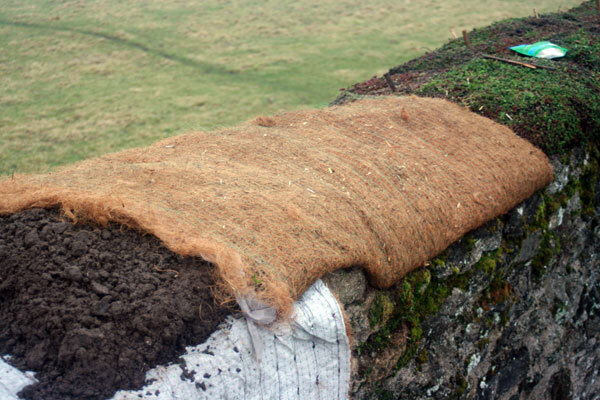 with water retaining gels, porous particulate, seeded mats) of any use? To investigate question 4 we are making use of a second field site located less than one mile away from our Wytham Woods field site. 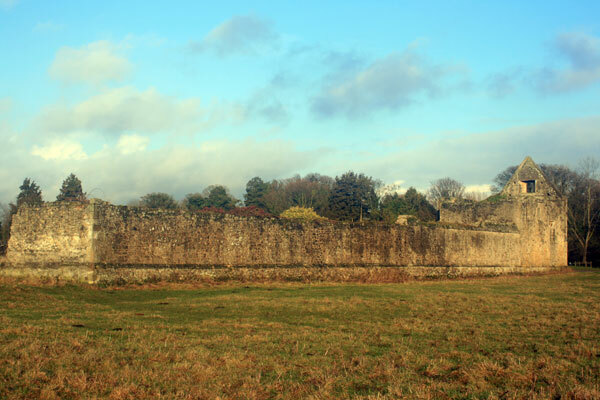 The ruined remains of Godstow Nunnery provide the ideal location for investigating this research question and one long section of the south wall of the nunnery has been capped with a variety of soft capping designs. 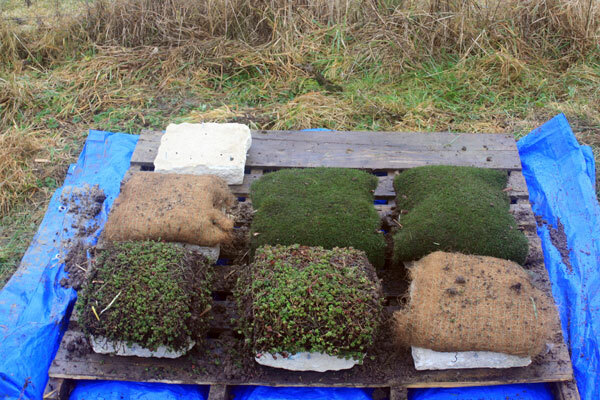 Eight trial sections of soft capping have been installed to test the relative performance of: local turf, commercial turf, a seeded mat and a sedum mat all with and without the inclusion of water retaining gel granules mixed in with the soil. The performance of these different types of soft cap are being monitored using a photographic resurvey techniques and some more detailed sampling. 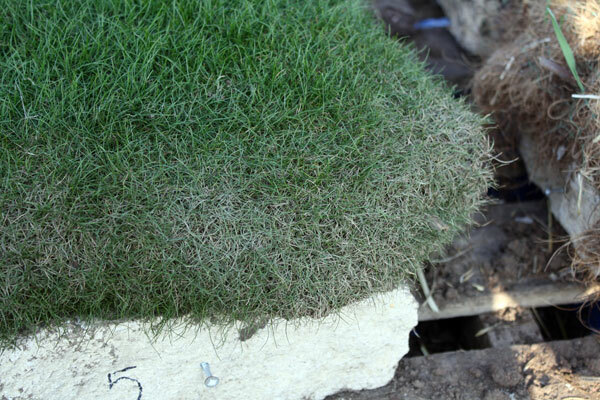 How does the performance of soft wall capping develop over 5+ year timescales as, for example, root mass forms? 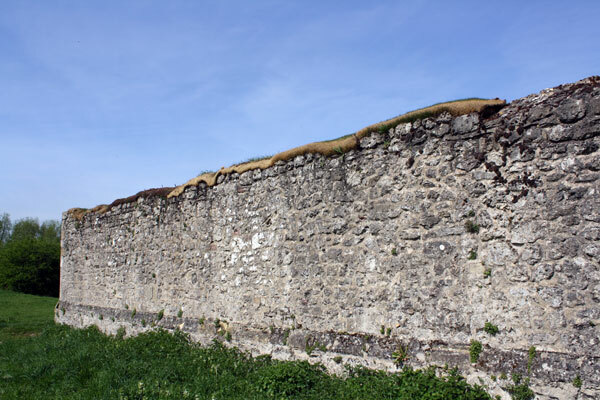 By monitoring the existing soft wall capping trials on English Heritage sites (installed during phase 1), as well as natural examples of soft capping we can to study longer term development of their performance. 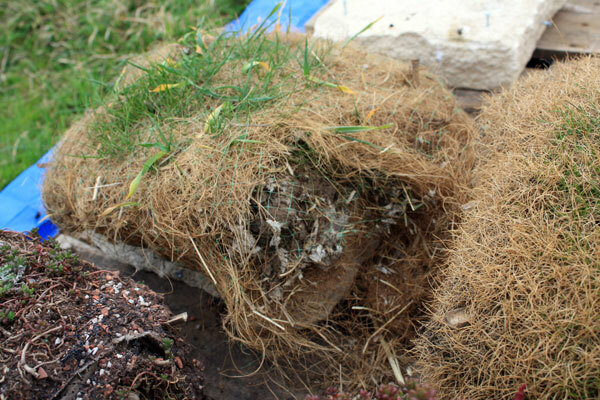 It is hypothesized, for example, that over time the roots of grass and other species will form a complex and coherent mass which will possess better water shedding qualities than in the first few years following installation. It is planned to investigate the changing performance of soft capping over time though (a) comparative rainfall simulation experiments on newer versus older soft capping and (b) detailed observations of the nature of the root masses and soil in newer versus older soft capping. Soft capping on the east side of the cloister wall at Byland Abbey (July 2006). 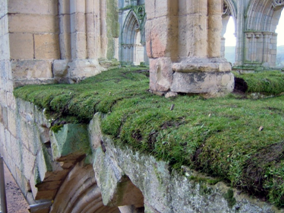 Soft capping installed high up at triforium level in the nave at Rievaulx Abbey (February 2005). 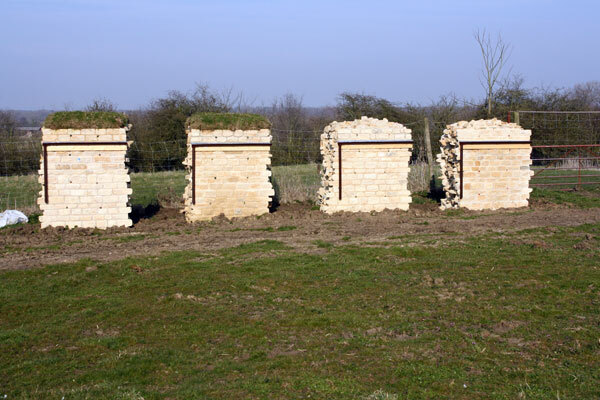 Test Walls at the Wytham Woods test site (November 2008). 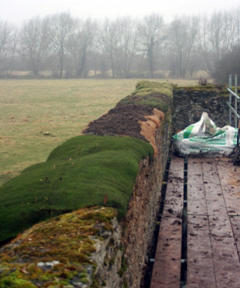 Installation of different types of soft capping at Godstow Nunnery (February 2009). 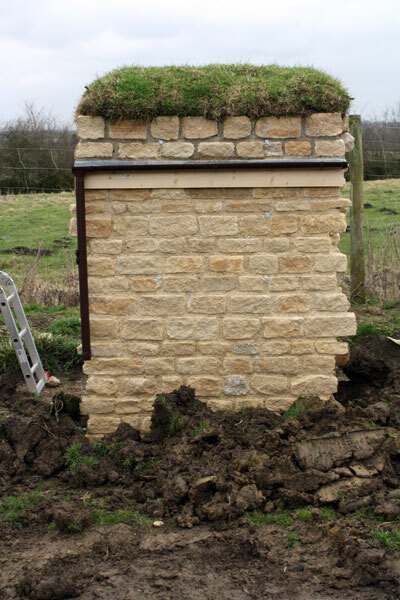 Question 1: To what extent does soft wall capping reduce moisture fluctuations within underlying stonework? 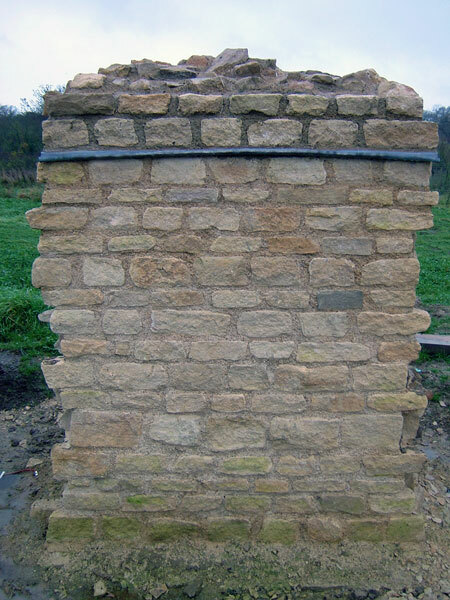 Question 2: Does soft wall capping have any damaging effect on vulnerable underlying stonework? Question 3: Are more complex soft wall designs (e.g. 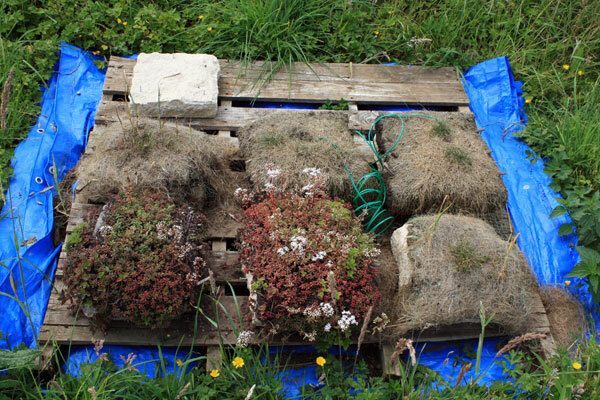 with water retaining gels, porous particulate, seeded mats) of any use? 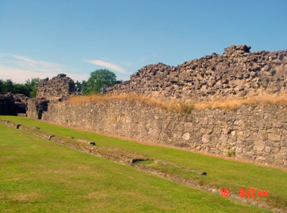 Please Note: These images have been produced by Colin Burns, Alan Cathersides, Chris Wood and Heather Viles and if reproduced should be credited to 'English Heritage Soft Walls Capping Research Project'. 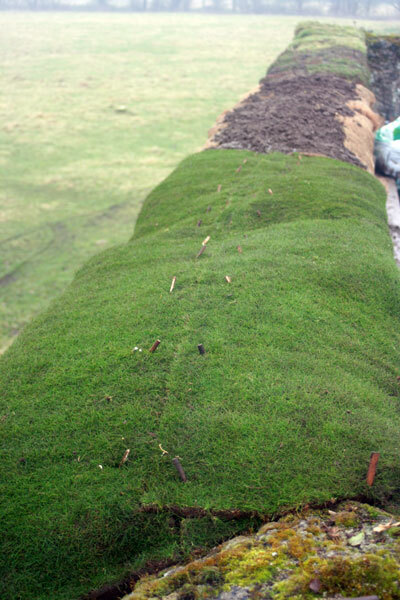 Image 1.1: Cutting turf for the soft capping at Wytham Woods Sawmill (November 2008). Image 1.2: Scaffolding erected on Wall 1 (West face) to install soft capping at the test site (November 2008). Image 1.3: Wall 1 West face post soft capping (November 2008). Image 1.4: Wall 3 West Face hard capped (November 2008). Image 1.5: View from above of Wall 2 post soft capping (November 2008). 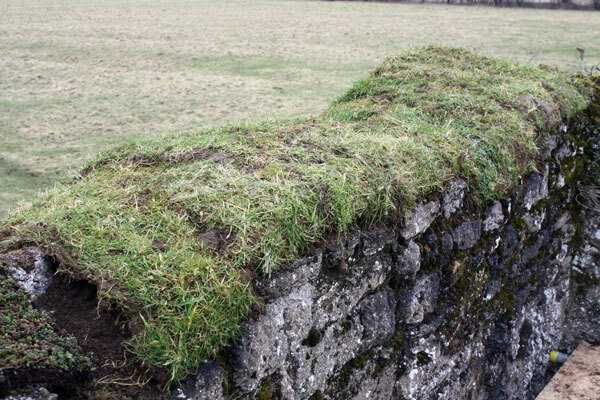 Image 1.6: Side view of the core of wall 4, photograph taken looking North (November 2008). Image 1.7: Colin Burns drilling 40cm deep holes into the walls for installation of wooden dowels (March 2009). Image 1.8: Wall 2 West Face after the guttering has been installed, the holes have been drilled for the wooden dowels and the trench has been partially backfilled (March 2009). Image 1.9: Back filling the trench (March 2009). 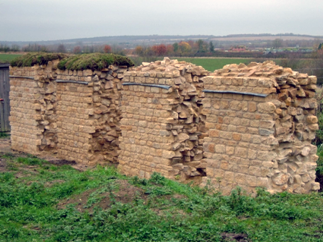 Image 1.10: The test walls at Wytham (March 2009). 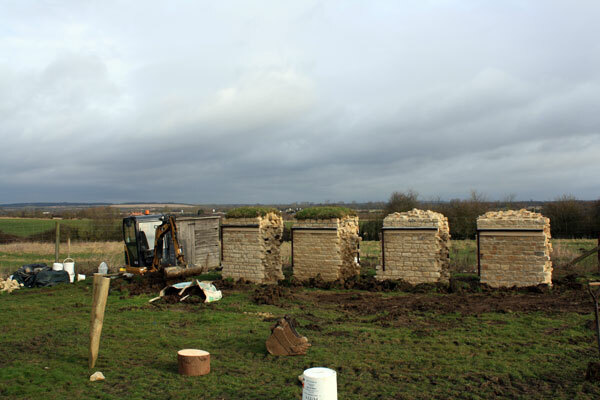 Image 1.11: Walls prepared for geoelectrics survey with electrode pads aligned along a centre line (April 2009). Image 1.12: Wall 2 west face prepared for geoelectrics survey along the centre line of the wall (April 2009). Image 2.1: All test blocks before soft capping (February 2009). Image 2.2: All test blocks after soft capping (February 2009). Image 2.3: All test blocks two months after soft capping (April 2009). 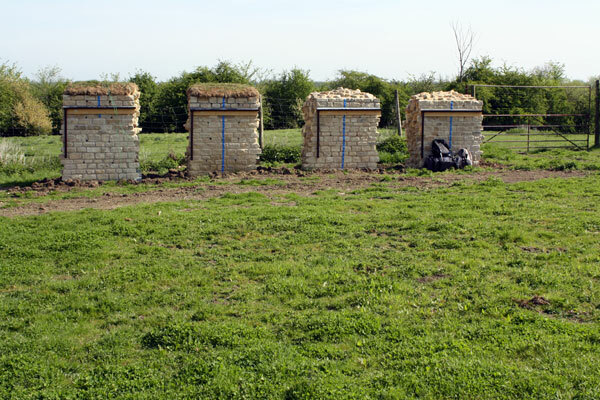 Image 2.4: All test blocks four months after soft capping (June 2009). 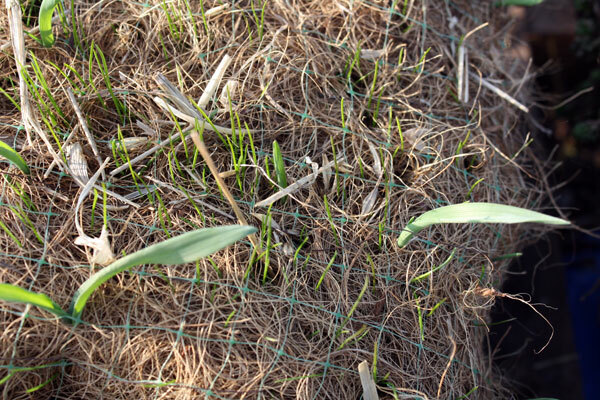 Image 2.5: Shoots growing through the seeded mat with water retaining gel (March 2009). 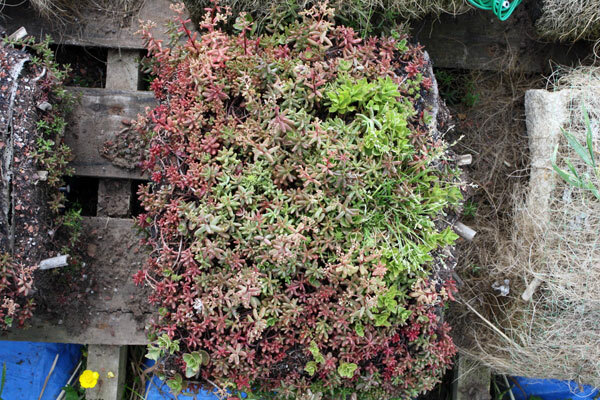 Image 2.6: Sedums growing at the base of the sedum mat soft cap with water retaining gel (March 2009). Image 2.7: Commercial turf without water retaining gel. 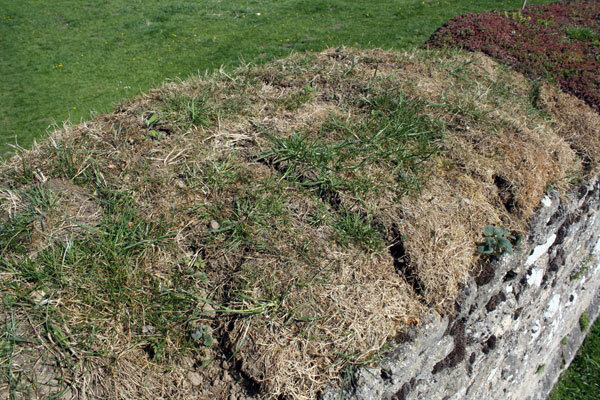 The turf is starting to dry out where it is most exposed to the sun (March 2009). 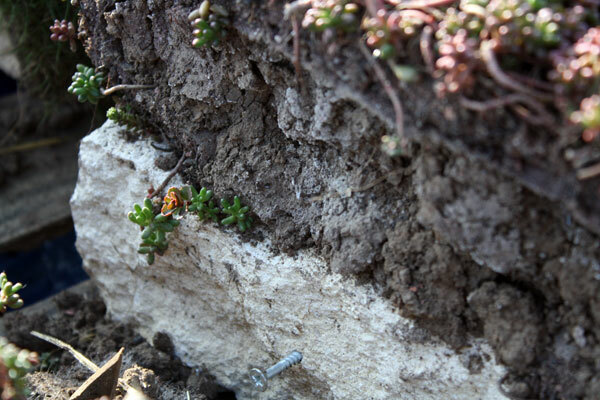 Image 2.8: Sedum matting without water retaining gel two months after soft capping (April 2009). 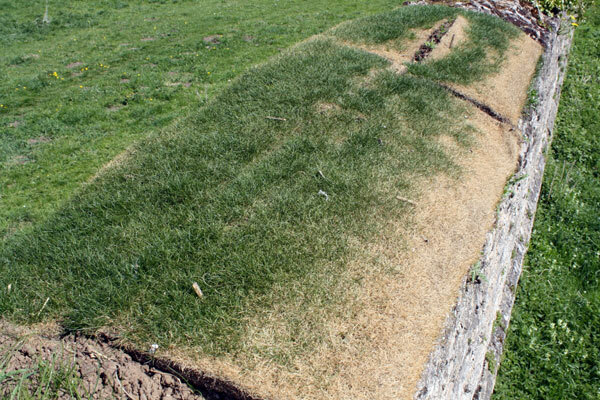 Image 2.9: Commercial turf without water retaining gel two months after soft capping (April 2009). Image 2.10: Seeded matting with water retaining gel two months after soft capping. The soft cap has been disturbed by mice (April 2009). 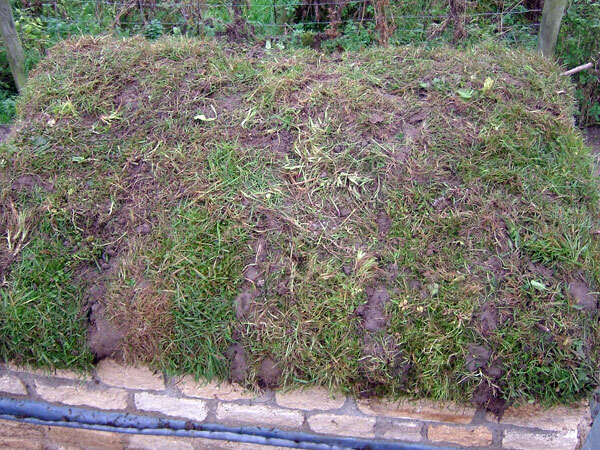 Image 2.11: Commercial turf with water retaining gel three months after soft capping (May 2009). 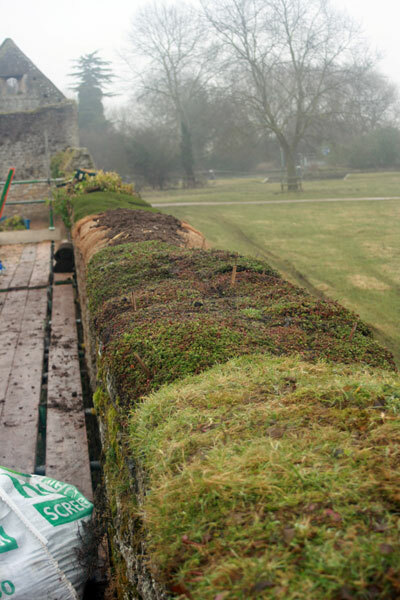 Image 2.12: Seeded matting (with water retaining gel) and sedum matting (without water retaining gel). 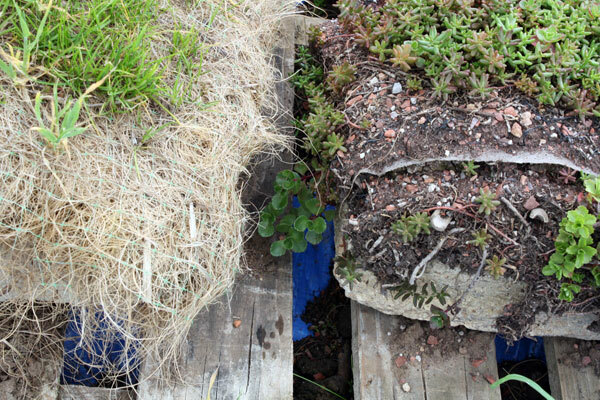 Image 2.13: Sedum matting with water retaining gel four months after soft capping. The sedums are flourishing and starting to flower. Image 3.1: Godstow Nunnery. 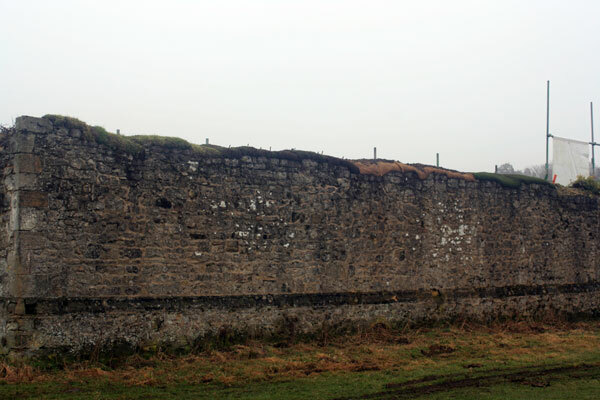 Photograph of the South wall, to be soft capped, looking North (February 2009). 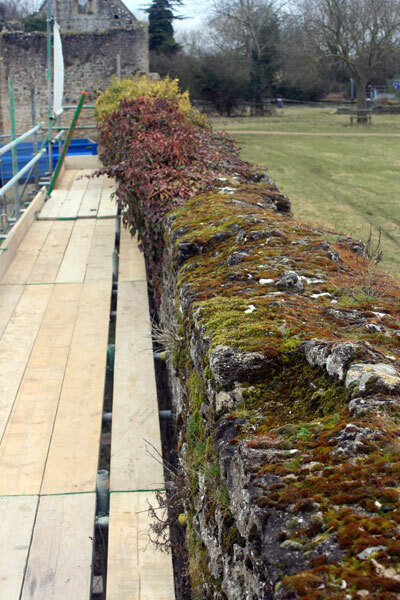 Image 3.2: Section of the South wall of the Nunnery with scaffolding before soft capping (February 2009). Image 3.3: Trial sections 1 and 2: Local turf cut from Wytham Woods Sawmill with and without water retaining gel (February 2009). 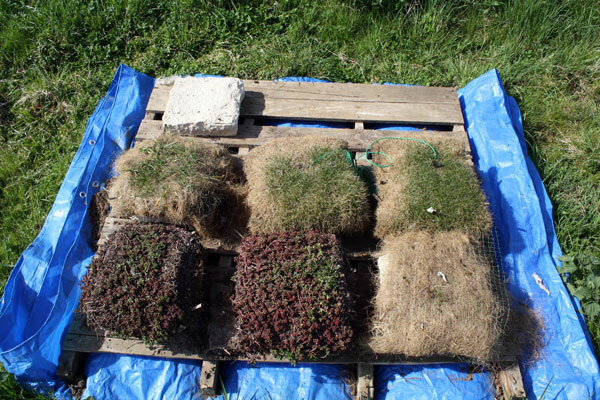 Image 3.4: Trial sections 3 and 4: Sedum mat with and without water retaining gel (February 2009). Image 3.5: Trail section 5: Seeded mat without water retaining gel (February 2009). 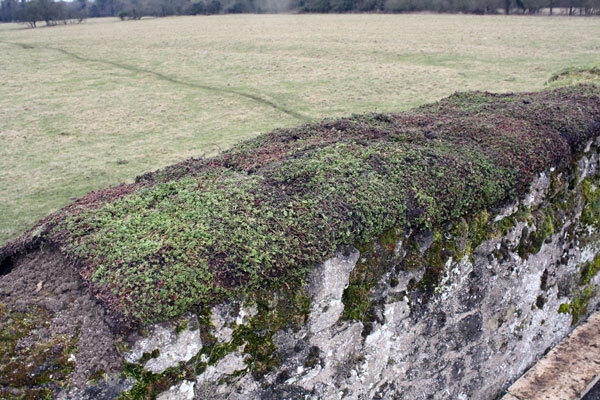 Image 3.6: Trail section 7 and 8 (with sections 1-6 in the background): Commercial turf with and without water retaining gel (February 2009). Image 3.7: Above view of all trail sections post soft capping (February 2009). Image 3.8: Ground view (looking North-East) of all trial sections post soft capping (February 2009). Image 3.9: Ground view (looking North-West) of all trial sections two months after installation (April 2009). 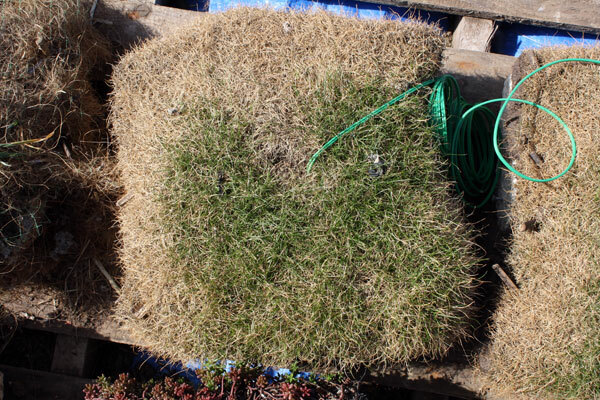 Image 3.10: Local turf with water retaining gel two months after installation (April 2009). 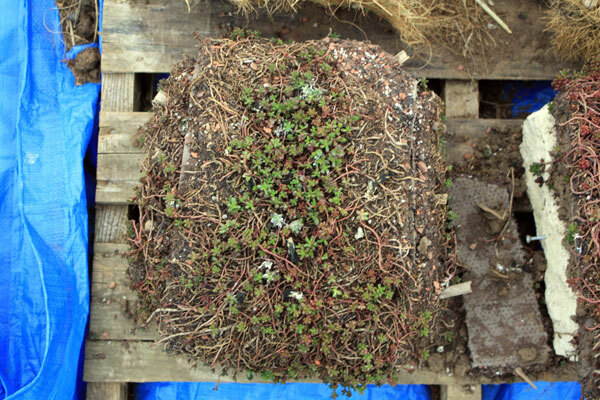 Image 3.11: Sedum mat with water retaining gel two months after installation (April 2009). 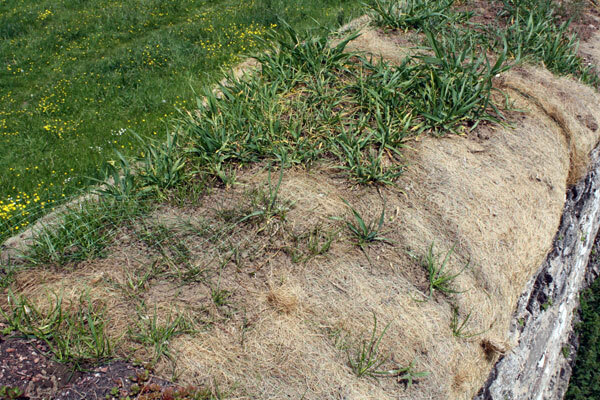 Image 3.12: Seeded mat without water retaining gel two months after installation (April 2009). 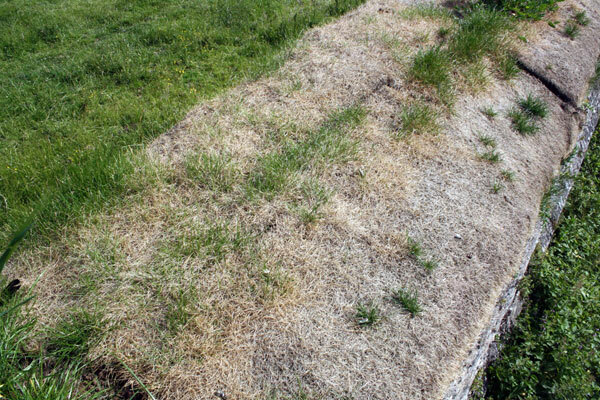 Image 3.13: Commercial turf without water retaining gel two months after installation (April 2009). 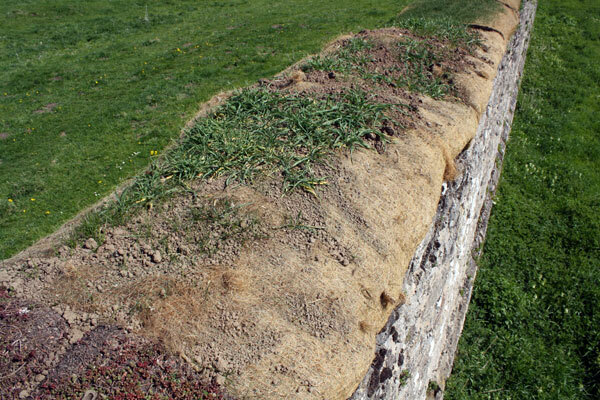 Image 3.14: Local turf with water retaining gel three months after installation (May 2009). 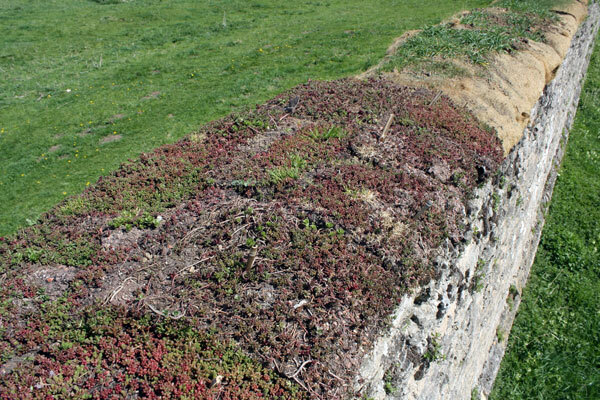 Image 3.15: Sedum mat without water retaining gel three months after installation (May 2009). 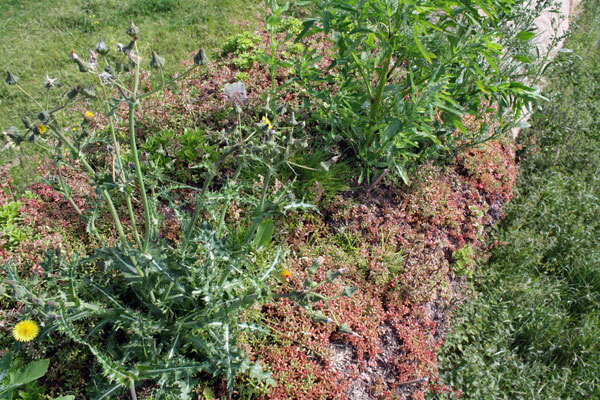 Image 3.16: Seeded mat without water retaining gel three months after installation (May 2009). 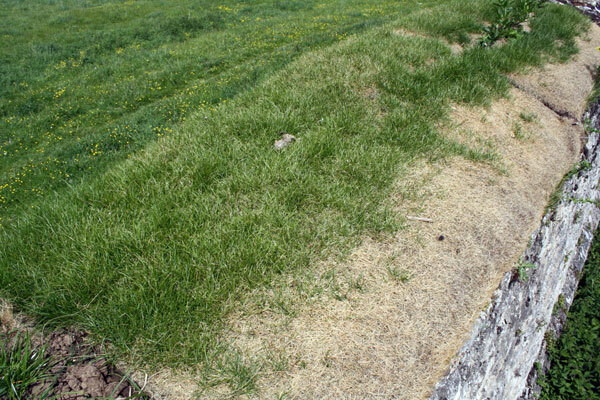 Image 3.17: Commercial turf without water retaining gel three months after installation (May 2009). 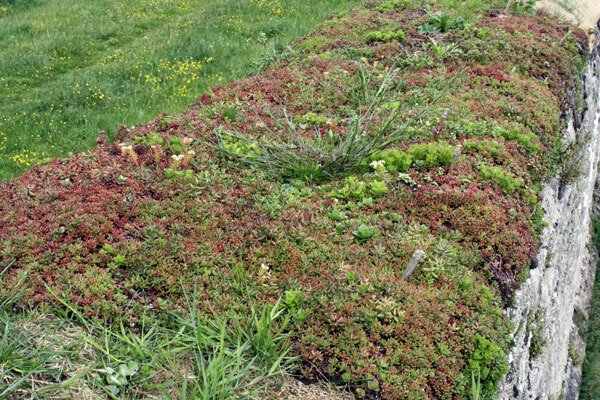 Image 3.18: Sedum mat with water retaining gel four months after installation (June 2009). 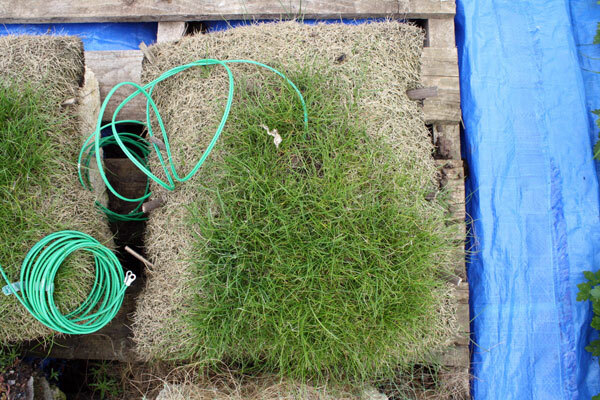 Image 3.19: Commercial turf without water retaining gel four months after installation (June 2009). Image 3.20: Ground view (looking North-East) of all trial sections four months after soft capping (June 2009). Wood, C. (2005) Soft capping: justifying a return to the picturesque. Context, 90: 22-24. 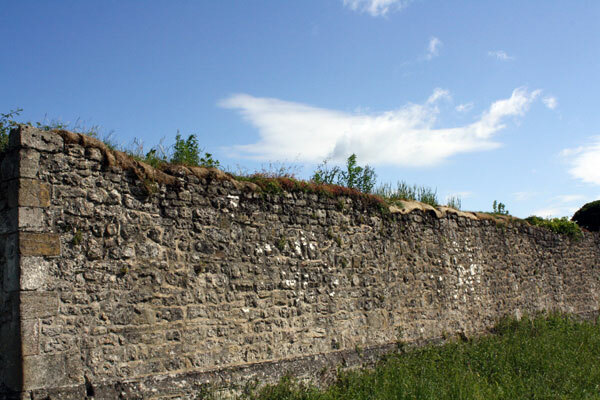 The soft wall capping research project is being carried out by the School of Geography and the Environment in association with English Heritage. Pia Windland, Former Research Technician, School of Geography and the Environment - who has carried out most of the laboratory work. Zoe Lee, School of Geography and the Environment - who has carried out most of field and laboratory work of the phase II in 2008-2009. Daniel Mace, School of Geography and the Environment - who collated most of the photographs and did initial data analysis. Mark Page, School of Geography and the Environment - who has carried out most of the field and laboratory work of the phase II in 2009-2010. Chris Stearn, School of Geography and the Environment - who carried out much of the dowel survey work at Hailes Abbey. Tom Stevens, Laboratory Technician, School of Geography and the Environment - who assisted with dowel surveys and did most of the data analysis. Mary Thornbush, School of Geography and the Environment - who provided the content for these webpages and contributed to both managing the project and producing the outputs.